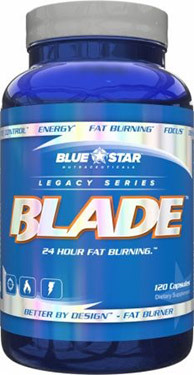 The Blade fat burner from Blue Star Nutraceuticals is one of the new options out there on the market. Fat burners are common products that are advertised to serve so many effective functions, while their label tells a different story. Blue Star Nutraceuticals claims to stand by its motto of “Potency. Purity. Honesty.” saying that it creates the brand designed for elite athletes. But whether it actually does that is another question. 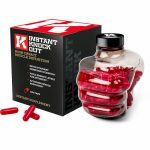 This fat burner in particular contains a proprietary blend, which masks the amount of each ingredient within it – the opposite of transparency. Once you’ve assessed your tolerance, Blue Star Nutraceuticals recommend taking 2 servings of 2 capsules of Blade each day. One serving in the morning and another in the mid-afternoon. However, this isn’t the best for maximum fat burning. For the best results you want something that has around 3 – 4 servings a day. This ensures that you’re constantly getting the nutrients you need to continue to burn extra calories, and cut down on your overall fat levels. With a degree of capsiate in this nutrient, sweet pepper offers some thermogenic benefits. By heating up your core temperature, the capsiate makes your body perform a cool-down process which burns additional calories while resting. 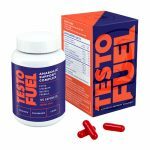 An amino acid that boosts energy levels and metabolism, however it may be under-dosed here. Studies suggest for the most effective results with L-Carnitine, you have to be using 500 – 2500mg for the best results. Although with 400mg, you still should get some benefit. One of the best natural thermogenics out there. The catechins in the green tea have a great effect on your body after being absorbed by promoting the fat burning hormone norepinephrine. You’ll also get a mild caffeinated boost from the herb itself. There’s a high amount of caffeine in Blue Star Nutraceutical’s Blade – and if you don’t have a high tolerance, this could cause side effects. Caffeine is usually a great stimulant to have in a fat burner, it increases energy, metabolism and power output in the gym. We just worry that there might be too much here. Also known as Bitter Orange Extract, there are little to know fat burning benefits of supplementing synephrine, but that’s not all – it can also lead to side effects. Especially when it mixed with nutrients like caffeine or green tea, both of which are in this product. Another nutrient that can lead to side effects if improperly dosed. Yohimbe is a tree bark that has been linked to appetite suppression. Very little studies have been done on this nutrient and its link to burning fat, however, it should help to some degree as an antioxidant. Panax Notoginseng is a Himalayan cure-all, with very little studies behind it. It might help with circulation. Astragalus Membranaceus on the other hand is an anti-inflammatory aid. Neither of these will do much for fat burning. A fatty acid that is usually taken with L-Carnitine. This helps boost antioxidant enzymes and may work towards decreasing blood glucose. It’s not going to do much for you from a fat burning perspective. Not a fat burning nutrient but more a food additive used to control acidity in foods. On the whole, this isn’t one of the best fat burners out there. Far from it. There’s only two thermogenics in here and many of the other ingredients cause side effects. If you want fast effective results, you’re better off looking elsewhere. The main risks with Blade are the synephrine and the yohimbine, and there are a few problems with each. All things that would definitely interfere with a serious cut. The Yohimbe on the other hand has the ability to cause anxiety, gastrointestinal distress and hypertension in some users. It’s in your best interest to avoid these kind of side effects. Overall this isn’t that much of a great fat burner. It has a few thermogenic nutrients, but not enough to make it stand out from the more effective ones on the market. There’s also an issue with side effects. Blade contains both synephrine and yohimbe, both nutrients that studies have shown to cause side effects when mixed with caffeine or improperly dosed. The servings need work too. 2 servings a day is okay, but it could be greatly improved by lowering the overall dosage and spacing it out over more throughout the day. A lot of the features with this fat burner could be greatly improved, if you’re considering Blade – there are better options out there. Thank you for the information; they almost got me. I am 43 years old. I am struggling to keep my weight in check and this abdominal fat, smh. I am “5’9” and i weigh currently 240. Normally i weigh between 220 and 225. I workout regularly and i have hypertension. It appears as I get older the harder it is to maintain a steady weight. I’m looking for help. I would like to get down to 200 or 210. Oh and my body is muscular I’m just not ripped. Hi James, it seems like you’ll want to maintain muscle while losing fat. Now, it’s important that you figure out your BMR and follow a high-protein diet eating under that calorie limit in order to lose body fat. I would like to lose weight by April 1st to 200lbs. I was at 264lbs last year now I’m at 243lbs. I want to know what is the best natural fat burning method to take? 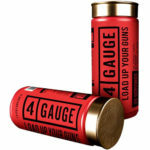 Thank you so much for the information on this product, I was looking at get it but thought I’d do more research on it first. I’m a pro wrestler on the Indy’s and a small time actor. I’m 5’9″ 217lbs, I go to the gym a few times a week for n hour/hour and a half, but sense my back injury I have been having a hard time getting my abs and losing stomach fat. Hi Stew, we’re not doctors, unfortunately. You should seek the advice of your physician before changing your meds. 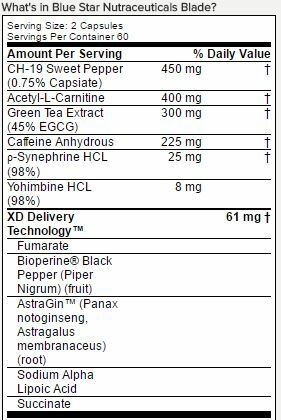 Thanks for the review on this, I was concerned about the megadose of caffeine from both the anhydrous and the green tea EGCG. So first: Is there a supplement out there that helps with weight loss/fat burning in men that doesn’t rely heavily on caffeine and it’s various manifestations/derivitives (I.e. Anhydrous, Green tea extract, etc.) in supplements? Through the years I’ve done research into caffeine receptors and the enzyme responsible for caffeine metabolism in the body. Of the three levels of caffeine sensitivity (Hypersensitive, Normal Sensitive and Hyposensitive), I’m hypersensitive to caffeine. Just consuming 1/2 of a 16 oz Diet Mountain Dew is enough to make the veins in my eyes bulge, dehydrate the tear lining in my eyes, causing serious increases in blood pressure (145 to 154 over 92 or similar, where 140 or higher is considered hypertensive blood pressure). Half a 16 oz bottle of Mountain Dew amounts to an approximate 36 mg of caffeine before my body reacts as if in cafffiene toxicity and causes many of my biologic systems to go haywire. This is somewhat unfortunate as it concerns the world of fat-burning supplements out there, as time and again, the primary ingredients in most if not all of the marketed fat burners contain caffeine anhydrous and/or green tea extract containing doses far exceeding my daily caffeine threshold of approx. 36 mg of caffeine. With a back injury that required extensive surgery, my options in the gym are limited as it’s quite difficult to find workouts that don’t engage the lower back for core stability and proper form/support in weight training, or aerobic options that don’t require the constant asymmetrical/alternating activation of the lower back muscles/glares from running on a treadmill/elliptical. So I turn to supplementation for an answer only to find my genetics hold me back from the all the variations and forms of the “magic pill” for helping with weight loss and such. Mind you, I’m also aware of supplements out there that are stimulant free but have “proprietary” ingredients known to increase estrogen in men, just like Soy Milk has shown to have estrogenic effects in males as well. We’re not doctors, so if you’re that sensitive to Caffeine, you should probably look for a stim-free product, or consult your physician beforehand. Its ok if i use this fat burner if your a women? Because iv been using it. We don’t recommend this fat burner for men or women. Synephrine and Yohimbine have been linked with a range of severe side effects. 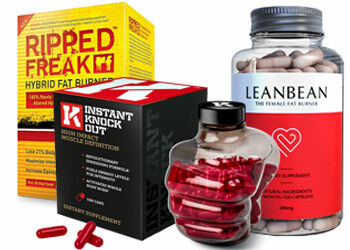 We recommend Instant Knockout, Hourglass or Lean Bean.